Turtles are fascinating animals that have existed for approximately 250 million years. Witnesses to the world's evolution and brave survivors of the ever changing planet, they are a constant reminder about the age of the dinosaurs and have been even called ''living fossils''. Despite the technological and scientific advances of our era, what we know about turtles is actually very little. The true nature about most of the elements of their behavior is unknown and the explanation about their origin is based on mere theories. It is believed that they evolved from small animals called cotylosaurus, which at some point began to grow an osseous material on their skin, resulting in the formation of the protective armor that covers their exterior today. They belong to the reptile family and are directly related to the iguanas, crocodiles and snakes. It was around 100 million years ago that they first began to adapt to life in the ocean, so in reality they spent about 150 million years on dry land. Turtles brains are not very evolved, but they do have the very well developed senses of vision, smell and hearing that provides them with incredible capabilities of orientation. Use of these keen senses allows the turtles to perfectly identify the precise place and exact moment where they will reproduce, even though they live dispersed throughout the vast oceans. 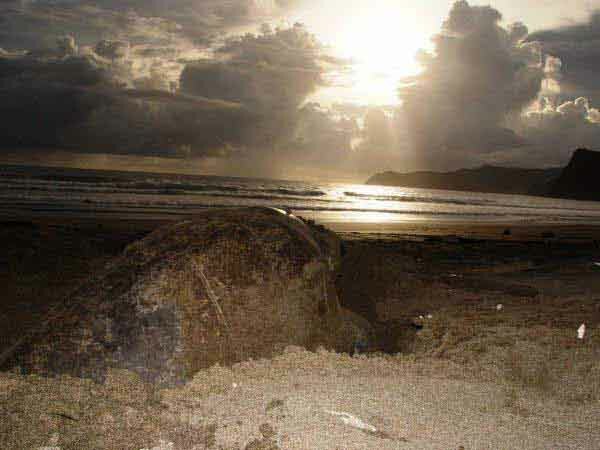 Each year, between July and November, thousands of Olive Ridley turtles arrive to the coast of Puerto Vallarta looking for the perfect place to lay their eggs. During this period, female turtles take transcontinental journeys to return to the same beach that they were born on to now lay their own eggs, while in direct contrast the male turtles will never return to the sand. Taking advantage of the protection of the night, turtles wait for the sun to set before choosing the perfect spot to lay their eggs. Once they have found part of the beach, far away from the rolling surf, they use their front fins to dig a hole approximately 6.5 feet in diameter where they will later build their nest. These holes in the sand are called beds. 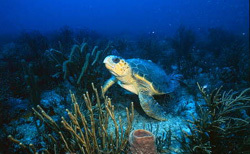 Turtles generally dig several beds before choosing the one they will use to lay their eggs in. When the turtle has chosen a bed, it proceeds to build the nest with its rear fins, the nest has an approximate size of half a meter and it has the shape of a bottle that widens towards the bottom. After laying the eggs, the turtle covers the nest with sand and then returns to the ocean. Between forty five and sixty days after theeggs have been laid the babies begin to hatch. The small newborn turtles help each other with synchronized movements so they can get rid of the sand that covers their nest. When they finally reach the surface their race to the ocean begins. Unfortunately, only 1 out of every 5,000turtles will reach adulthood. The newborn turtles are around 2 inches in length and they have to fight against endless dangers during the first days of their lives. The most common threats for the baby turtles are octopuses, crabs and seabirds but the most aggressive danger they have to overcome is man himself, since it is the human race that have brought them to the edge of extinction. This is the reason why the Mexican Government has declared an absolute ban on the exploitation of this species and has implemented many protection programs. 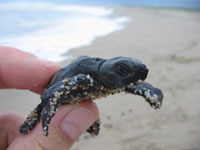 Seven out of the eight species of turtle known in the world lay their eggs on Mexican beaches, hence there is a great emphasis put on their preservation by the Mexican government. The turtle camps are just one of the many measures that have been taken to protect the marine turtle.Turtle camps are places where artificial nests are built to guard the eggs that have been laid on the beach, so they can be kept safe from predators. These camps rely on the help of both specialists and regular people. These groups are generally made up of scientists who carry out important investigations and volunteer students who donate their time and effort to this worthwhile task. Turtle camps feature night patrol programs andturtle liberation programs. You can also be a part of this worthwhile effort, by joining in with one of these programs. You will first get to watch an informative instructional video, then you will be guided by an expert every step of the way on this great adventure. Come and be a part of the conservation of this fascinating species!